Last weekend’s wine train adventure started out with a woman accosting me, telling me about my all-encompassing beauty (she was quite agressive with her compliments, remember? ); this weekend started with an old lady ajumma voluntarily picking lint off of my coat as I stood above her seat on a crowded bus. Koreans…they are drawn to me. Saturday’s trip to the DMZ (demilitarized zone) with Jon, Marisa, and Dave was without a doubt the scariest thing that I’ve done voluntarily in my 25 years as a living being. The DMZ is the 4km stretch of land mostly along the 38th parallel that divides North and South Korea, and has done so since World War ll when the U.S. occupied the South and the Soviets occupied the North. The line divides them and each half has 2km on its own side.Technically, they are still at war, making the DMZ a pretty intense place to spend your Saturday afternoon. We started out by meeting our tour group at the Lotte Hotel in Seoul-a pretty good and amiable group overall, made of only foreigners as Koreans aren’t allowed to visit unless they apply specially to the government. Well, a good group except for the one annoying American dude (why is it always the American dudes?!) who felt it his job to speak loudly and take on our fabulous tour guide “the handsome Mr.Kim” for factual expenditure. Mr.Kim was a deliciously camp Korean, letting us know that he was able to cut short the obligatory 18 month military obligation that is mandatory for all Korean men because he is “too handsome”. He also expounded the virtues of kimchi as a substitute for yogurt, and spoke extensively on plastic surgery and the educational system in Korea. He was a funny, amusing man who gave our otherwise seriously dour trip a bit of a lighter touch. While we drove to the DMZ he informed us about all sorts of interesting things (besides the yogurt and all that). 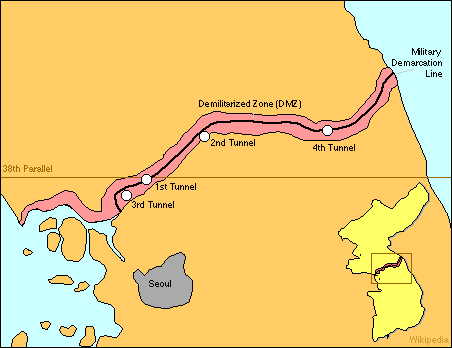 Example: the main highway from Seoul to Panmujon where the DMZ is located is a straight shot, so as you go farther north the bridges are anti-tank prepared. Meaning that they are filled with dynamite on the inside and in the case of an attack by the North they can be detonated to block tanks from coming through. The first stop of our trip North was at Imchingak, the last publicly accessible railway station in the South. The place is set up as a sort of amusement park/carnival area where southerners can enjoy their last bit of freedom. I also saw a stand selling “DMZ Chocolate”…hm. The train station that was built there was meant to go to North Korea up to Pyongyang, but has actually only ran once. It was built as an agreement between North and South to each build their half of the railway line, meeting at the military demarcation line. At the time that both sides’ construction was to be completed, the North claimed that they did not have the resources to finish, letting the South do it for them. 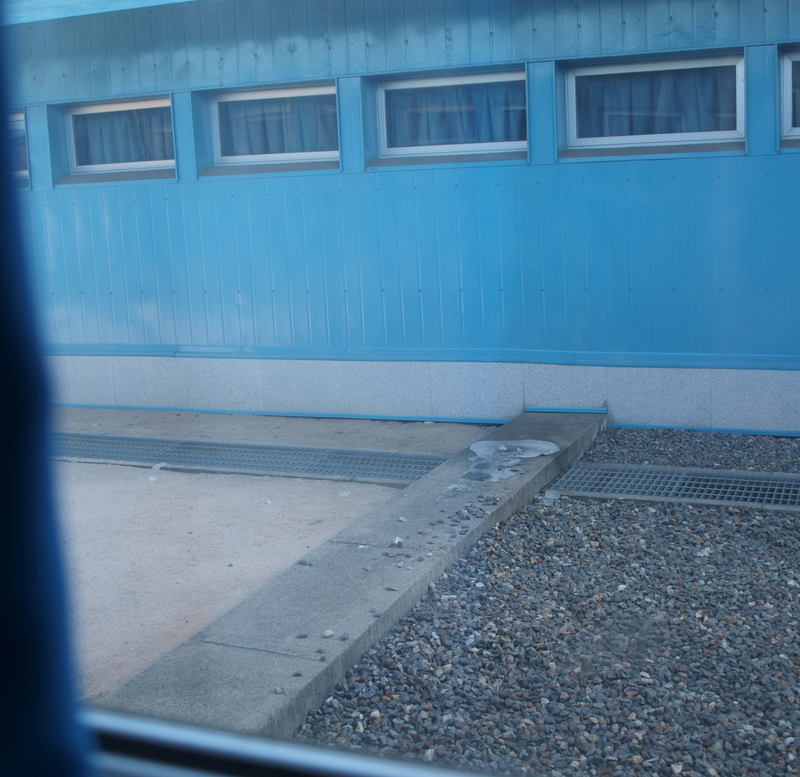 We got back on our bus and headed further north to a town called Panmujeon, which houses the Joint Security Area. We were taken inside a building and listened to a presentation about the history of the area. Our passports were checked, as well as our cameras (Jon and Dave had to leave their giant lenses on the bus) and we signed a document that said we realized we could be “subject to injury or death.” Lighthearted and reassuring indeed. Then we got on U.N. buses and headed to the actual JSA. This is the terrifying place the North and South face off with one another every day. The area is composed of buildings for both sides and the Military Demarcation Line (literally, a line of concrete that provides a physical boundary between the two) goes down the middle. At the JSA we were allowed inside the center conference room after being given a lecture that told us all the things we were not to do, including taking pictures only when given permission and most importantly, no pointing. This is because we were being watched by the North and apparently the action of taking your hand out of your pocket and pointing can be construed as pointing a gun, and then your head will get blown off. Frightening, yes, and Dave immediately pointed at an air conditioner. Thankfully, his head is still intact. Inside the main conference room is a large table where all important meetings between U.N. and U.S. officials, North Korea and South Korea have met up. 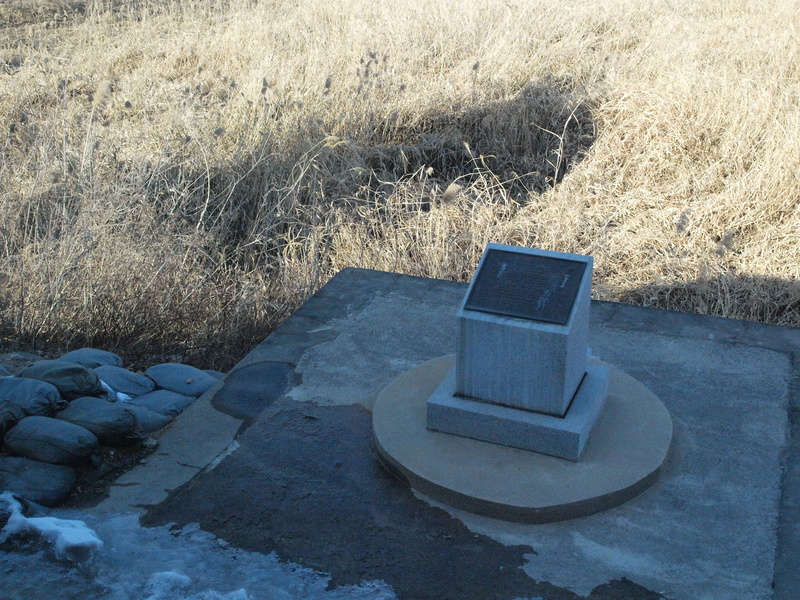 The building is right on top of the MDL, so technically half is north, half is south, and it is guarded as such. The soldiers inside are severe, to say the least. The Military Demarcation Line-the sandy part is North, then the line. The gravel is South. 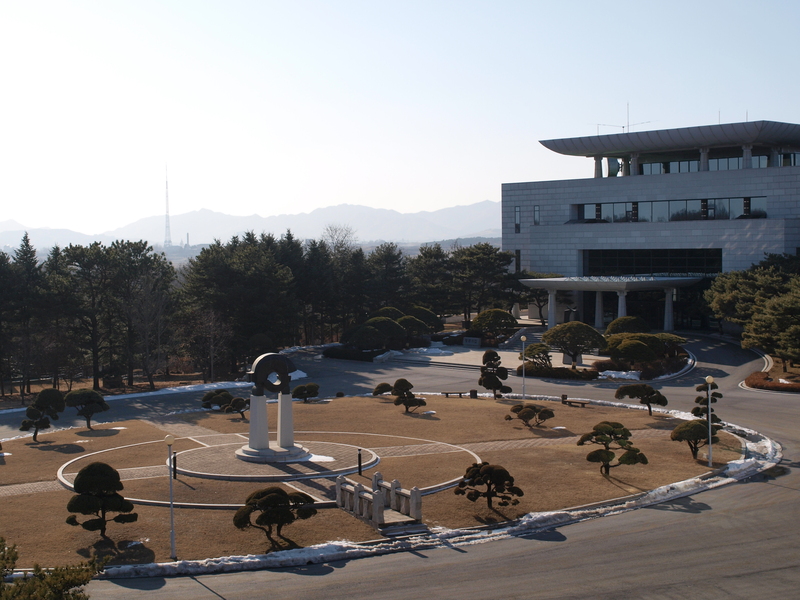 We then went up a post that allowed us to get a wider view of the area, including the Sunken Gardens, where a Russian defector on a tour of the North Korean side decided to make a run for it in 1983. He wasn’t captured, but several people were killed in the confusion. After that sobering story, we got back on the bus to drive ohhh soooo slowly back by the main conference buildings to take pictures. Creepily enough, a North Korean guard watch the entire time with his binocular from the North’s massive building across the way. We were reminded again not to make any contact. Taekwondo-stance, half hidden from the North soldiers in case of attack. The bus drove us in a large circle through the rest of the territory. 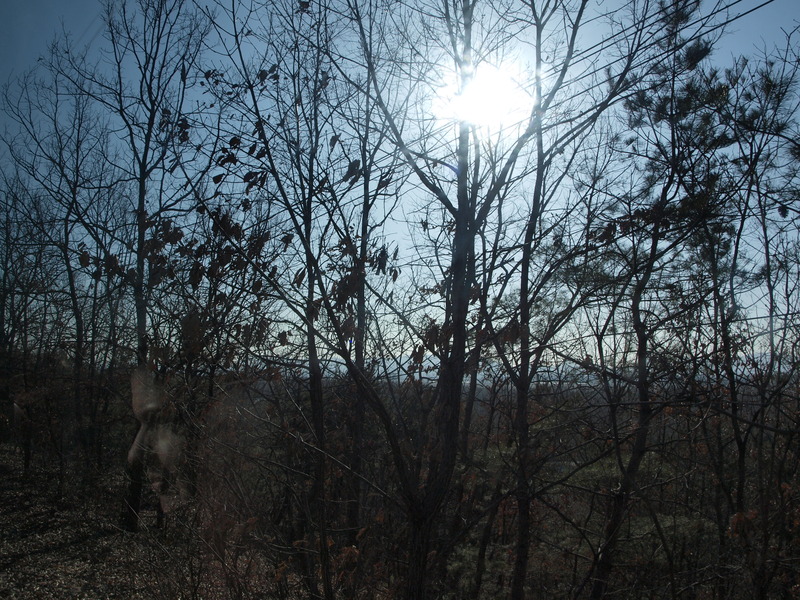 We stopped at the spot of the “Axe Murder Incident” where North Korean soldiers killed 2 American soldiers in the 1970s who were cutting down a tree-with their own axes no less. It sends shivers down my spine. This incident was what divided the formerly integrated JSA in the first place. This marked the end of the tour and we made it back to the…wait for it…DMZ gift shop. 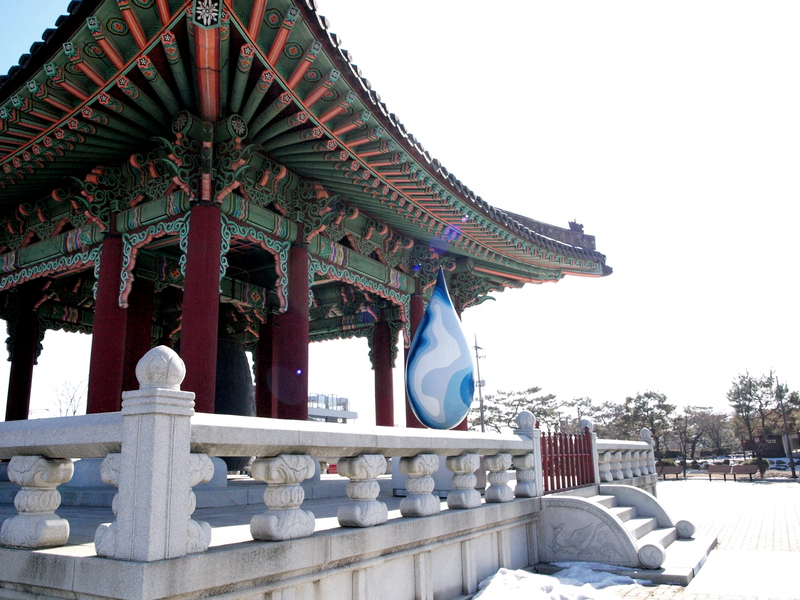 It mostly consisted of the same kind of traditional touristy things that you find everywhere else, but it also sold soju from North Korea, currency, and stamps. Pretty interesting stuff. I picked up a couple of things, and we began the hour journey back to Seoul. I for one was never so happy to get back to the dreary concrete of a wintery day in Seoul. Very well written Mo. A sobering eye opener. I had friends stationed at “The Z”. They had many interesting stories.